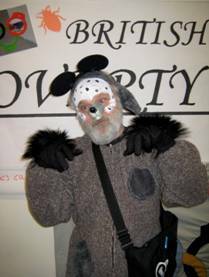 Chewy the Rat is the next in our series of Poverty Olympics mascots to be featured here. Chewy is a well-known, though unpopular, resident of Vancouver’s Downtown Eastside. Rats thrive when rental accommodation is not kept up properly. In Vancouver, there is a Standards of Maintenance bylaw that says landlords must keep their premises vermin free, but the city often fails to enforce this aspect of the bylaw. While Chewy brings an element of comedy to the Poverty Olympics, the reality is that living with pests such as rats is just one more challenge faced by poor residents living in low-income housing, and the rat problem can be made worse by development in the neighbourhood. This past summer, Vancouver Coastal Health recommended that developers be ordered to exterminate rats before a building is torn down, because rats will flee from demolition sites and more into other buildings in the area. This issue is particularly relevant in a high-density area like the Downtown Eastside. 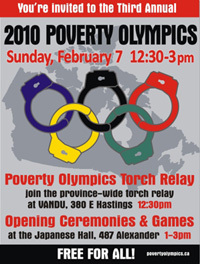 Come to the 3rd annual Poverty Olympics on February 7 and see if you’re brave enough to pose for a photo with Chewy!